The 25 acre [10 ha.] 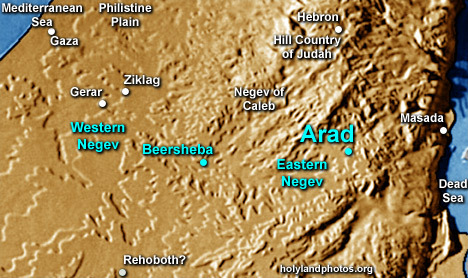 site of Early Bronze Age Arad is located 18.5 mi. [30 km.] east-northeast of Beersheba. Ruth Amiran spent 18 seasons excavating the Early Bronze Age city. Four distinct EB levels (strata) have been discovered. The high point of occupation was around 2800 B.C. — some 800 to 1000 years prior to Abraham's arrival in Canaan. Probably 2500 people lived at this large site. Arad is situated on the northeastern lip of the eastern basin of the Biblical Negev. The region only receives about 12" of rain each year. Good grain crops are typically produced in only one of four years. The soil in the area is a windblown "loess" soil. The city is in the shape of a large horseshoe, being high around the edges, lower in the center where the water collection portion of the city was located, and open at one end. Early Bronze Age Arad was abandoned by 2650 B.C. Early Bronze Age cities in Canaan were known for their large size, massive city walls - with semi-circular towers attached - and "broad house" type buildings and Arad is no exception. The later, Iron Age citadel was excavated by Yohanan Aharoni.